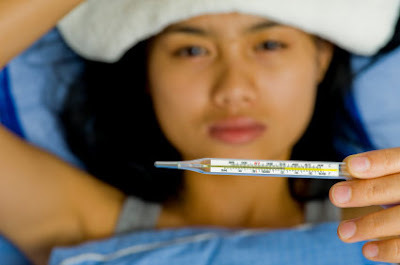 Your mouth taste becomes worse during fever. This lead to weakness in the body. Many times it happens that when we eat anything it comes out. It happens due to high fever. Your digestion system becomes weak and taste removes from the mouth. You should eat such food which gives your relief in fever. Bread: You can eat without ghee or oil bread when you have fever. Rice: It is easily digested. Soup: Soup relives cold and fever. You can drink hot tomato soup or carrot soup. It gives energy to the body. Porridge: It is lighter and low calorie food. You can eat it with lemon pickle. Boil Potato: Put black peeper in boil potato and eat it. It gives relief in throat infection and cold. Apple: White and red cell increase if you eat apple when you have fever. It is fruitful for body to fight viral bacteria. Fruit Juice: When body temperature increases then you should drink water and lemon so you do not have dehydration. Your stomach remains full. The juice should not be cold. Basil Tea: This herbal tea gives relief from cold and fever. It can change your bad mood during fever. Egg: Boil egg has nourishes which increase antibodies and red cell in the body. It is helpful in fighting infection in the body. Hot Milk: You do not have energy when you have fever. But hot milk gives you the energy. Channa: It is very healthy and fruitful in breakfast. You can eat it mixing with sugar. Oatmeal: It is light and easy to digest. Poha: It fills the stomach. It can be made without spices and plenty of vegetables. Oats: It is very healthy and your stomach remain full for long time if you intake it in breakfast.